Nazila Fathi: In July 2003, I was covering a protest near the Tehran University dormitory. The demonstrators felt invincible: Their numbers had swelled night after night despite orders from the authorities to withdraw. They chanted slogans demanding more freedom; “Death to the Dictator,” a reference to the country’s supreme leader, Ayatollah Ali Khamenei, who still has the final word on all state matters; and “Forget About Palestine, Give Us a Thought,” to express their anger at their country’s foreign policy, which came at a cost to domestic investments that could have created jobs for unemployed youth. Later that night, the protests were crushed. I watched members of the Basij, the paramilitary arm of the Islamic Revolutionary Guards Corps, beat and stab civilians. I’ll never forget seeing two Basij soldiers throw the limp body of one young man into the trunk of a car. By 3 a.m., the vigilantes were drumming on their trucks in a show of victory. Hundreds of protesters had been arrested and tortured. As I followed news of the protests in Iran last week, I remembered that July night. Even more than the Green Movement of 2009, the recent protests — and the reaction to them — recalled those of the early 2000s. Both then and now, moderate political forces controlled Iran’s presidency and its Parliament. And in both cases, the country’s conservatives deployed intimidation, violence and deceit to undermine the moderates. The question now is whether the conservatives will succeed in dominating politics and crushing the Iranian people’s desires for reform. This time, they have some help on the world stage — from an American president with a prolific Twitter account. But they also face a persistent challenge: The people seem more determined than ever. After that night in July 2003, the conservatives thoroughly obstructed the reformist president, Mohammad Khatami. Mr. Khatami’s allies and backers were jailed; he was deprived of the political muscle to introduce promised social, political and economic reforms. His voters became utterly disillusioned. Two years later, a hard-line conservative, Mahmoud Ahmadinejad, was elected to replace him. The reform movement was set back for years. Something similar may be happening now. The recent protests seem to have been started in the city of Mashhad by conservative opponents of the reformist President Hassan Rouhani to undermine his government. But events quickly grew beyond the conservatives’ control. Mr. Rouhani had already stirred anger against the government among middle- and lower-class Iranians in December when he publicized some details of the 2018 budget revealing the astronomical portion of state funds going to religious and military entities. 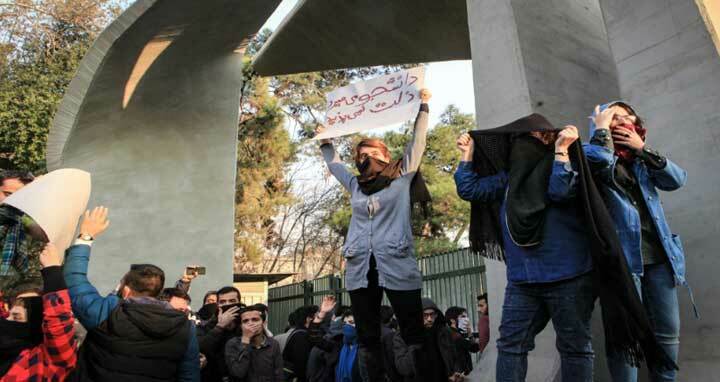 Lower-class protesters hijacked the anti-Rouhani protests and turned them into full-fledged anti-regime demonstrations that spread around the country. The protests now seem to be dying down but they may have achieved the conservatives’ goal: to discredit Mr. Rouhani and his moderate allies and purge them from politics. Mr. Rouhani’s government negotiated with world powers for the 2015 agreement that ended his country’s nuclear weapons program and also relieved Iran from some international sanctions. That agreement was widely popular among Iranians, who don’t want to see their country isolated. Mr. Rouhani won a second term in 2017 on a mandate to fix the economy and liberalize the country. Iranians have expressed their aspirations for a more democratic and accountable government many times over the years. But the wrong kind of support can be damaging. President Trump’s tweets about the protests, saying Iranian protesters will see “great support from the United States,” provided ammunition for the conservatives to crack down on the protesters and distract attention from the real problems that led to the uprising. The stakes are high for the conservatives. Ayatollah Khamenei is 78, and his health has been the source of speculation for years. President Rouhani will be part of a leadership council that will replace the supreme leader until his successor is appointed. Further, the president can use his influence, depending on his political affiliation, in selecting the next leader. It is these two positions, the presidency and supreme leadership, that the conservatives are determined to control. The next election is scheduled for 2021. The propaganda machine has already started to churn out diatribes against Mr. Rouhani and his allies, making many Iranians fear a repeat of the 2005 election. The daily newspaper Kayhan, which is close to Ayatollah Khamenei, blamed Mr. Rouhani’s government for failing to end embezzlement, thus stirring anti-regime sentiments. Some analysts even believe the conservatives instigated the demonstrations to damage the president at a time when the economy is weak, prices for basic goods are skyrocketing and unemployment is endemic, and to show that the nuclear deal has failed to improve the economy. There are several steps Mr. Trump can take if he truly wants to help the Iranian people change their country: He can hold Iran accountable for human rights violations. More important, he can keep the nuclear deal in place and avoid reimposing sanctions. Walking away from the deal would be a gift to Iranian conservatives, who could use it to foment the kind of nationalism against an outside enemy that has been crucial to their existence. Finally, the United States can provide satellite internet access to Iran so that activists can inform people and communicate when the regime shuts down domestic internet access. These protests have been a sign of awakening, even in rural areas, and signify the historic moment that the tide has turned against the Islamic regime, even among its ardent supporters. People in those outlying areas expressed their anger over the regime’s policies inside and outside Iran. They, too, want to be accepted as free, responsible members of the international community. The regime may succeed at ending the street protests, as it did in 2003 and 2009, but it won’t be able to end the anger that simmers beneath the surface.